Home events Go Green Guinness World Record Happening International singing St. Patrick Go GREEN with St. Patz!! Mark ur calendar on the SeVenTeen MaRch which is a Saturday & participate in this internationally renowned celebration of the year! It starts from 6pm - 12am & the whole street/jalan of Changkat Bukit Bintang will be exclusively reserved for U & ME with Irish inspired buskers, games and comedians that would keep US entertained through the ENTIRE night!! Talk about parrtttaaayyy!! OH! Before I forget, this year’s St. Patrick’s Day, Guinness is attempting to set the Guinness World Record by hitting the 1 million attendance mark. And if u're a Nuffnanger like me, then u can submit ur pledge while confirming ur attendance for the “Friendliest Day of the Year” through Facebook or St Patrick’s Official Website. 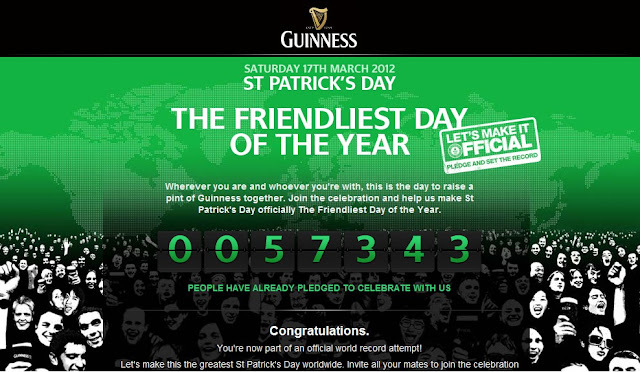 So what gesture will it take for me to make St. Patrick's Day the "Friendliest Day of the Year"? Yess!U got that right! I will SING to be a part of this event!! I'm no pro at it, but I just love singing! While u're at it, come SUPPORT me LA!! Come click on my ChurpChurp Social SHARE with ur friends! See my blog post for more info! 10 free pints of Guinness Stout! Thank you Nuffnang! 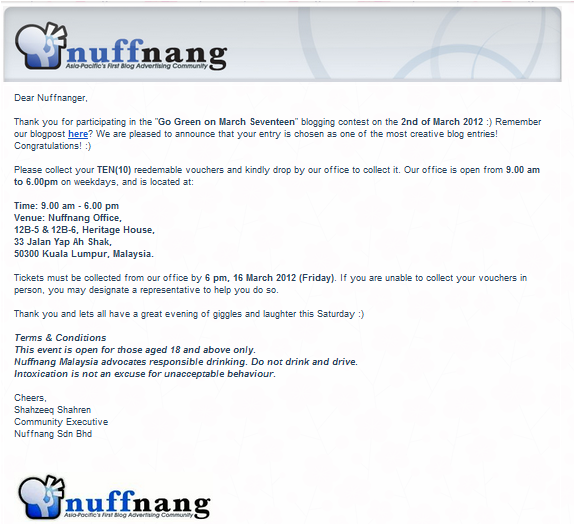 Who wanna come with me to Changkat, Bukit Bintang KL on 17th March 2012 - 6pm onwards!?!?! And pls come in GREEN!! !